Caramelly-smooth with hints of citrus, lightly sweetened with sugar for the perfect balance of refreshment and sweetness. Now you can enjoy this refreshing coffee in the hot summer, just add ice! Because summer is no time to stop enjoying the bold, satisfying taste of Starbucks® coffee. 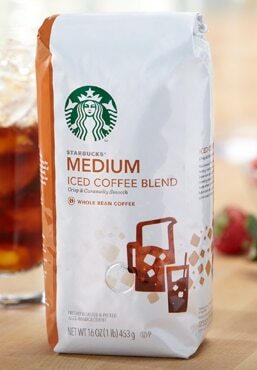 When the weather warms up, all it takes is a few seconds to brew up some refreshing Starbucks VIA® Iced Coffee. Lightly sweetened with cane sugar and specially designed for mixing with cold water, each packet brews up a rich and tasty 16 fl. oz. of 100% natural instant and microground coffee. Serve over ice to add an extra bit of chill to your chill-out time. A fruit salad and a wide-brimmed straw hat.